Because Nell had her horoscope cast, it is believed she was born on February 2, 1651 at 6:00 AM, probably in Oxford. She was the younger daughter of Helena Smith. Her father is unknown but this is evidence to suggest it was a possibly Royalist army Captain named Thomas Gwyn. We don’t know if her parents ever married but we do know Captain Gwyn ended up in debtor’s prison in Oxford. Helena moved back to London, taking her two daughters with her. Neither Rose nor Nell were educated and couldn’t even write their names. Helena was a drunk and ran a bawdy house near Coal Yard Alley in Covent Garden where her girls poured drinks for customers and may have even worked as child prostitutes. Nell also worked selling oysters and cinders, becoming a real life Cinderella. When the Monarchy was restored under King Charles II after the fall of Oliver Cromwell, one of the first things Charles did was reinstate live theater which had been banned under Cromwell. Charles established the Theater Royal in Drury Lane as his own company which was run by Thomas Killigrew. 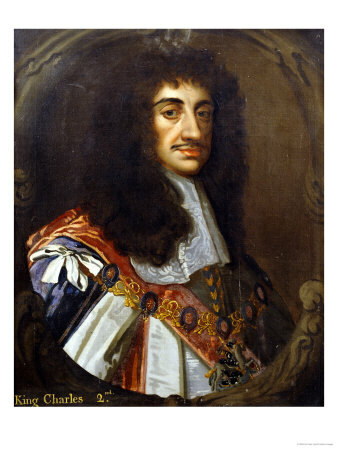 Charles II was the first King to actively attend the theater. As part of the enterprise, he licensed the theater to allow women to act women’s parts where they had been played by men before. This allowed women to have a genuine occupation as actresses. In 1662, Nell became the mistress of a man named Duncan. She soon tired of him but not before he got her a job selling oranges to the crowd at the theater in Drury Lane. After about a year of selling oranges, Killigrew noticed Nell with her delightful and fun personality and ability to mock the actors. He introduced her to two actors in the company, John Lacy and Charles Hart, who immediately began to train her. She had an affair with Hart that was followed closely by the London population. By November 1664, Nell was acting and by the following April, she was a household name. Most actresses of the time were dark eyed and dark haired. Nell was different because she had red hair and hazel eyes. She was very proud of her dainty feet and pretty ankles and never missed a chance to show them off. Diarist Samuel Pepys wrote volumes about Nell and it’s because of him we know so much about her. Nell didn’t care for serious, dramatic, or heroic roles. She really excelled at comedy, as if she was born to play it. She also loved to swear. In June of 1665, bubonic plague raged in London and the King’s court moved to Oxford. The theaters closed and the actresses and actors were called to Oxford. For the next eighteen months, we don’t know Nell’s whereabouts or what she was doing but Thomas Killigrew was making extensive improvements to the theater in Drury Lane during the break. From September 2-6, 1666 the Great Fire of London demolished much of the city. The theater finally reopened in October and Nell was back on stage. In March of 1667, Charles was at the theater when Nell made her debut in the play “Secret Love, or The Maiden Queen”. Nell caught the eye of the Duke of Buckingham, who immediately came up with a scheme. 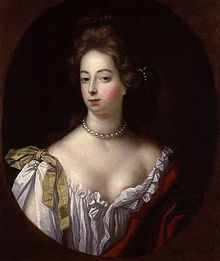 He wanted to tempt the King with the fascinating Nell Gwyn in an effort to lure the King away from his dominating, long- time mistress, Barbara Castlemaine, Duchess of Cleveland. Buckingham appointed himself as Nell’s manager. The King asked for Nell but she demanded £500 for the trouble of becoming the King’s mistress. Charles refused to pay. But she did receive invitations to star in court performances. Soon Nell and Charles were getting on famously. She didn’t become his mistress right away, preferring to be friends first and continuing her acting career. Eventually she relented but remained on stage for three more years. Nell established herself as the King’s “country mistress” and even taught him how to fish. By the spring of 1669, they would attend horse races at Newmarket which they did for the next 14 years. Charles commissioned Christopher Wren to build a large house for himself and a modest house for Nell in Newmarket. Two other retreats visited by Nell and the King were a house in Bagnigge, near Kings Cross and Windsor. On summer mornings they would swim in the Fleet River, a tributary of the Thames. In 1669, her acting career was beginning to wind down and during the summer, Nell saw more and more of the King. It was during this time she became pregnant with her first child by the King. The boy Charles was born on May 8, 1670. From the time of the fall of Barbara Castlemaine to the coming of Charles next demanding mistress Louise de Kéroulle in 1670, Nell was Charles main mistress. Louise had been in the employ of Charles’ beloved sister Minette. When Minette died after the Secret Treaty of Dover had been signed between Charles and Louis XIV of France, Charles requested that Louise come to England. He had met her during the secret negotiations. Louise was to become Nell’s greatest rival for the King’s affections. She was something of a snob and was easily irritated with Nell. Nell took great delight in outwitting and humiliating Louise. Both women were unique and seemed to satisfy Charles in different ways. Four months after the birth of her first child, Nell was back on stage. This was highly unusual and attests to her need to maintain some independence for herself. She moved into a small rented house in Pall Mall. Even with the birth of a child, the King was not forthcoming with benevolent gifts. But she did want to be near Whitehall where the King was. At the same time he gave Barbara Castlemaine titles and huge sums of money. He also moved his wife, Catherine of Braganza into Somerset House. Now Louise and Nell could share the King to everyone’s entertainment. Nell’s return to the stage was successful. She loved to end the show by reciting the epilogue and then dancing a jig to the delight of the crowd. Even though Nell threatened to keep acting, it appears she didn’t return after 1671. She retired at the age of 21 after a spectacular and dramatic career. Shortly thereafter, she moved into a splendid house at 79 Pall Mall. It was originally leasehold but Nell persuaded the King to give it to her outright a few years later. The house had a fair garden that was next to St James Park, close to Whitehall which could be seen in the distance. Thus she and the King could remain close. On Christmas Day 1671, Nell gave birth to her second son, James, named after the King’s brother. Nell’s home at 79 Pall Mall became her own salon. She wasn’t interested in politics so she invited those she liked and who amused her. She had music, skits, card playing and gambling, soirees and supper parties. After the parties, her guests would end up rambling in St. James Park. Her most magnificent possession was her bed. It was fashioned from Nell’s favorite metal and was designed by Nell herself. This four poster ornate bedstead included figures representing Nell and Charles was made of silver. She was very proud of her petticoats and loved showing them off and she also liked to dress in men’s clothing. Nell would travel around town in her sedan or coach and people would wave and greet her. The people loved her and would often leave flowers at her door. She loved to attend the theater and keep up with her old friends. Her sons never lacked for anything. She was sometimes invited to attend state dinners. In the summer of 1673, Charles created Louise Duchess of Portsmouth. Nell was furious. She still had no title and her boys had nothing. In December 1675, Hortense Mancini, Duchess of Mazarin, the last of Charles great mistresses arrived at court. She eclipsed Louise basically driving her from court. Hortense was Nell’s new rival for the King’s affections. Finally, in December 1676, Charles named Nell’s eldest son Baron Heddington and Earl of Burford. He gave the two boys the surname of Beauclerk. In 1677, several attempts were made to lure Nell back to the theater but she refused. In January 1678, her house in Pall Mall was burgled and much of her silver stolen. In June 1678, she sent her son James to Paris for his education. In 1679, her mother died in a drowning accident followed by the first signs of a long deterioration of the King’s health with his first attack of an ague. Later in the fall, Nell fell from a horse in Newmarket. And at the age of 30, libels began to write of the loss of her looks. In May of 1680, Nell fell seriously ill, probably from syphilis or gonorrhea and Charles had another attack of ague. About a month later she learned of the death of her son James in Paris. Charles made a gift to her of Burford House near Windsor and she began remodeling. From 1681 until the King’s death, Nell led a quiet country life at Burford House and followed the King and the court as it traveled. Charles’ health was declining. He suffered from venereal disease and the proscribed panacea at the time was treatment with mercury. In April 1681, he gave Nell the lease to Bestwood hunting lodge near Sherwood Forest. 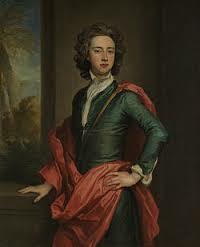 In January 1684, Charles made their son Charles Duke of St. Albans. Charles also had plans to make Nell Countess of Greenwich but it never happened. In January of 1685, Charles became fatally ill and died on Feb. 6. Nell was at a complete loss emotionally and financially. King James II, Charles brother, finally gave her and her son some income. Nell lived on quietly. She became ill, probably from the effects of venereal disease and suffered for 30 months before dying on November 14, 1687. The funeral took place on November 17 at St. Martins before a packed crowd. Nell always remained faithful to the King. He was her greatest friend. I always love reading about Nell. Charles Beauclerk’s biography of his ancestress has been a valued resource and reference when I was writing my novel about her and KIng Charles’s son, the Duke of St Albans and his Duchess. And the current Charles Beauclerk has kindly corresponded with me from time to time during the writing process. I love Nell too Margaret. I really enjoyed the Beauclerk biography. Excellent read, I’m very surprised that a movie hasn’t been made about her life. Thank you for this. Very informative and interesting. Not wanting to be too facty, but Oliver Cromwell didn’t fall, he died at the full height of his power. His son Richard became Lord Protector but not being much interested in the job (he preferred the life of a country gentleman) and not having the support of the army, Charles II was restored to the throne to ensure some stability. No worries Harry. Good point. Thanks for reading. She really was fascinating Clanmother! Glad you enjoyed it. Resilience and humor – a powerful combination! Thank you!!!! What a lively, absorbing story, full of new information, (all new to me at least) & fascinating. You clearly show the high regard she was held in. Clearly she was a fine actress, but acting was not a reputable job, practitioners were treated with suspicion and contempt, since from from London Paris & Venice, the profession was regarded as close to/ almost synonymous with, prostitution. Yet, despite her lowly social & professional status, Nell was clearly held in high reagard, not just by the people, but at court and even by the queen. What a contrast from the fun, lively 17th century world of Restoration, Stuart England, to the dour Puritans before, or the Victorians still to come ! Great piece Susan, a terrific read. You are very kind Arran! This piece practically wrote itself it was so much fun. You have some good points about the acting profession. I think Nell enjoyed acting. It suited her personality so well. Thanks Tammy. Glad you enjoyed it . She was fun to write about. Ans she loved to swear. (Haha) She was livley but remained faithful even though her King had others. Amazing story! Thanks Susan! I really had a good time writing about her because she’s so much fun. Nell Gwynn was truly a fascinating woman, and you have put together a wonderful article on on her life, from beginning to end. I applaud you for going into detail about Nell and Charles’ relationship dynamic and how they spent their time together, and also her years at Pall Mall, which I have always found interesting. And I do believe that Nell really was the great love of Charles II’s life. Where Nell was beloved by the English people, her rival Louise was not. One day while Nell was out riding in a carriage, the London mobs attacked her carriage because they thought it was Louise who was inside. Nell popped her head out of the carriage window and merrily told the crowd not to worry, because it was “only the Protetant Whore.” I love that story because it shows Nell’s self-deprecating sense of humor. And, despite being a lower-class mistress of the king, she earned the respect of many of the high-born court ladies, including Charles’ wife, Catherine de Braganza. Another thing I wanted to add is that Charles made arrangements for Nell before he died, instructing those in his service to , “take care of poor Nelly.” Of course, these wishes were not carried out entirely as Charles had dictated, but for the most part Nell and her son were looked after. Also, It is funny that Nell named her second son “James”, since she often took great pleasure in teasing Charles’ dour brother, calling him “dismal Jimmy”-this was the future King James II of England, mind you! 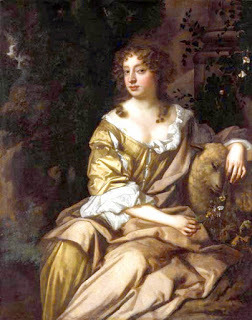 For those interested in learning more about Nell Gwyn, I would agree with your choice of “Nell Gwynn” by Charles Beauclerk. The author is a direct descendant of Nell and King Charles, and Charles has remained a family name. Beauclerk did meticulous research for this book, coming up with some new information and interesting theories on the parts of Nell’s life that have been shrouded in mystery. I especially like the attention he paid to Nell’s career on the stage, and her relationships with the other women in Charles’ life. “BeingBess” is dedicated to celebrating the life of Elizabeth Tudor (1533-1603) and the legacy of her reign as Queen of England (1558-1603).”BeingBess” is dedicated to celebrating the life of Elizabeth Tudor (1533-1603) and the legacy of her reign as Queen of England (1558-1603). Thank you Ashlie! I didn’t have enough space to add the points you made. She really was fascinating! What a sad story… However, it was how it was back then. I have heard of her name, but knew nothing else apart from her selling oranges… Thanks! Thanks for reading. I find her to be interesting because she stayed faithful to the King through it all.